RG Ratcliffe argues that Beto doesn’t need to choose between running for President and running for Senate. Why doesn’t Beto run for both the presidency AND the U.S. Senate? Beto could do it under a provision known as the LBJ Law. (Sec. 141.033 of the Texas Election Code for the Legal Eagles amongst you.) The law was passed to give then-U.S. Senator Lyndon Johnson the opportunity to run for re-election at the same time he ran for the presidency in 1960. Had the Texas Legislature not enacted the law, LBJ would have had to choose to run for one office or the other since in Texas a person is only allowed to run for one office at a time. But the LBJ Law makes an exception if the second office being sought is president or vice president. LBJ lost the top race to John F. Kennedy, but won re-election to the Senate, a job he gave up for the vice presidency. Democratic U.S. Senator Lloyd Bentsen used the provision to seek re-election while running as Michael Dukakis’s running mate in 1988. The fact Dukakis only received 43 percent of the Texas vote in his unsuccessful presidential run did not stop Bentsen from raking in 59 percent of the state vote for his Senate re-election. Republican U.S. Senator Phil Gramm used the provision in 1996, and it allowed him to win re-election even though his presidential ambitions flamed out in Iowa in February. A dual run like the one Gramm made would give Beto the chance to seek the top prize as he remains viable as a candidate for Senate from Texas. If Beto won the Democratic presidential nomination, he’d become a two-pronged threat to President Trump or whomever the Republicans nominate. If he lost in Iowa or New Hampshire to any of the array of Democrats running for president, Beto could come home to concentrate on challenging Cornyn. See here for the background. Honestly, just asking the question is enough to answer it, and the answer is “because that doesn’t make any sense”. I think we can all agree that the Texas of 1988, which allowed Lloyd Bentsen to coast to re-election while co-starring for Mike Dukakis, doesn’t exist any more, and Phil Gramm was barely a memory as a (truly lousy) Presidential candidate by the time November of 1996 rolled around. (I’d completely forgotten that he’d been in that race.) There’s no way Beto could spend enough time in Texas as a Presidential candidate to satisfy the voters here, and anything remotely like his 2018 campaign would mean he’s neglecting pick-you-favorite-swing-state. If he could mail in a Senate campaign and still win that would be one thing, but that ain’t happening. Nice idea, but this is very much an either-or situation. Ross Ramsey throws a bit of cold water on the surge in voter registrations. Turnout isn’t nearly as volatile as registration. Over the past 10 presidential elections in Texas, the percentage of Texas adults registered to vote has gone as low as 65.3 percent in 1992 to as high as 85.4 percent in 2000. The registered voter numbers have a problem, though. At any given time, some number of the people who have registered in Texas have moved or died. Election officials purge the rolls from time to time to correct for that, but using registered voters as a base for turnout calculations is messy. The voting-age population, on the other hand, is based on population estimates. It starts with a census and changes with births and deaths — or, to be more accurate, deaths and the numbers of people turning 18 each year. Using that number instead of registrations, Texans appear to be much more consistent in their voting turnout: 41 percent of Texas adults voted in 1996, the low year, and 47.6 percent showed up in 1984 and 1992, the two years with the best turnout over the past 10 presidential elections. Those numbers don’t sync very well. If you’re measuring turnout by counting the number of actual voters among people on the registered voter rolls, you’ll get a relatively high number — and one that’s as volatile as the state’s database of registered voters. If you measure it by comparing the number of adults in the state with the number of actual voters, you’ll get a more predictable result. More than four — and fewer than five — of every 10 adults has voted in each of the past 10 presidential runs. You can run the voter rolls up with an active registration push, but it doesn’t necessarily mean turnout will improve. These are fair points, and to be sure most of the interest around the higher voter registration totals is centered on the belief that This Year Is Different. Which it unquestionably is, but that doesn’t mean it’s different in a way that will necessarily lead to a greater-than-usual number of people casting votes. So let’s take Ramsey’s figures and use that as a basis for estimating statewide turnout this year. According to the SOS Turnout and Registration page, there are 19,307,355 adults of voting age population in Texas. Let’s apply four different turnout levels to that and see what we get. The 40.97% and 47.64% values are the high and low totals cited by Ramsey. The other two, the ones in the middle, are the actual turnout of voting-age population numbers from 2008 (45.55%) and 2012 (43.73%). To put that in some perspective, due to the overall population growth in Texas, a turnout level equivalent to what we had in 2012, which I think we can all agree was generally considered “meh”, would still represent an increase of 450,000 voters over 2012 and 365,000 voters over 2008. Consider that 2008’s actual total of 8,077,795 represents 41.84% turnout of 2016 VAP, and 2012’s actual total of 7,993,851 is merely 41.40% turnout of 2016 VAP. Unless 2016 is a historically low year for turnout, more people are going to vote this November than they did in 2012 and 2008, quite possibly a lot more people. So, to Ramsey’s point, we are almost certainly going to have more people vote this year than have ever voted in Texas, but sheer population growth will account for much of that. We need to crack nine million before we can really talk about a new high-water mark, and we have to push ten million to get to a point where we can say that more than half of adult Texans cast a ballot. It remains to be seen just how different this year will be. Oh, and by the way, voter registration numbers continue to climb. Texas is closing in on 15 million registered voters who will be eligible to cast ballots in the November election after a surge in registrations that probably will outpace the run-ups to the last three presidential elections, according to an analysis of state registration data by the former research director for the Texas Republican Party. “The biggest takeaway is there is significant interest in this presidential election,” said Derek Ryan, the former Texas GOP data guru who is now an Austin-based Republican consultant who specializes in voter lists. According to Ryan’s analysis of the Texas secretary of state’s registered voter database released Monday, Texas actually passed the 15 million threshold last week. He puts the number at 15,002,412. But the secretary of state’s office said its most recent count had the state at 14.9 million registered voters. The Texas voting age population is 19.3 million. With another week to register before the Oct. 11 deadline, Ryan said he expected new registrants between the primary and general election to exceed the numbers logged in the past three presidential cycles. As of last week, Ryan said, 764,000 voters had registered since the March 1 primary, compared with 834,000 post-primary registrations in 2004, 823,000 in 2008 and 581,000 in 2012, when the primary was held in May. Ryan said that of the new registrants, there were nearly 20,000 more women than men, that people with Hispanic surnames made up nearly a quarter and that the average age of the new registrants was 36.4 years old, with 43.1 percent under 30 and 34.1 percent ages 30 to 49. On the face of it, that should all be good news for Democrats and their presidential nominee, Hillary Clinton, who polls better in Texas with women, younger voters and Hispanics. But Ryan said that considering the provocative nature of Donald Trump’s campaign with regard to women and Hispanics, he was surprised their numbers did not spike higher. Women outnumber men in the electorate generally, and the 2.3 percent differential between female and male new registrants is pretty much par for the course. The 23.3 percent of new registrants with a Hispanic surname is identical to the 23.3 percent of all registered voters with a Hispanic surname, Ryan said, and the real test is turnout in a state that regularly places at or near the bottom for voter participation nationally and where Hispanic turnout is historically especially low. Ryan also cautioned that the use of Hispanic surnames to identify Hispanics is inexact. The deadline to register is October 11. We’ll see where we are then. Your analysis fails to look at what I call the “Straight Ticket Judicial Vote” as opposed to the straight ticket vote. The STJV is the total vote cast by the trailing Judicial votegetter of each party. The assumption is that anyone voting for that person got the votes they did for one reason only – their party affiliation. That was the 97.2% the article referred to. When I got elected in 1988, and for the election cycles on both sides of that year, the % of STJV was about 85%. In other words, 15% of the voters cast a two party judicial ballot. If that were still the case, there would be fewer mullets elected judge (of both parties). The point I made to the Chron reporter that called was that at least the people who were going through the ballot and casting votes for every candidate of both parties were thinking a little on who to vote for, unlike the lever pullers. Judge Davidson is correct, that’s not what I looked at, and I didn’t grasp what he was getting at when I wrote that post. Which wouldn’t have really changed what I wrote, because I was specifically intending to address Sen. Dan Patrick’s bill and the uncritical accolades he has received for filing it. My point was that straight-ticket voting, whatever you may think of it, has hardly had the effect on judicial races that is being ascribed to it. The numbers here and elsewhere clearly prove that. That was my point. Judge Davidson includes the 1st and 14th Appeals Court candidates in his calculation, so I did the same here. This does have an effect on the numbers, as Eric Andell carried Harris County in 2000, thus dropping the low Republican score to under 50. 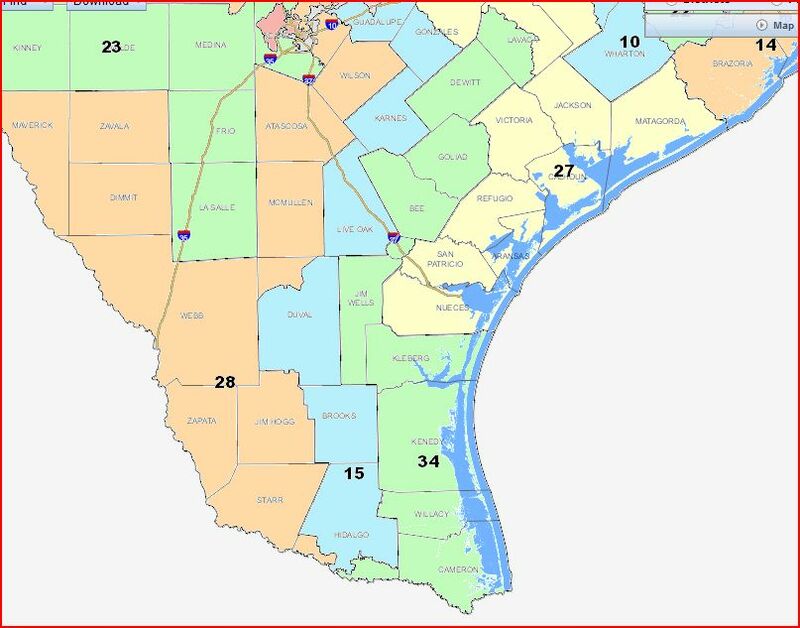 Limit the reckoning to Harris County-only races, and you’d get 97.6 for 2000 (there were all of two contested non-Appeals Court races that year, as previously noted). 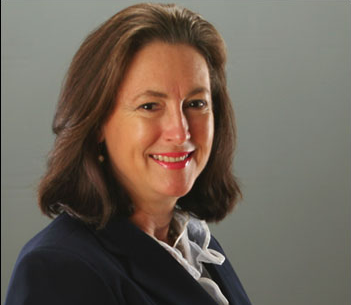 Margaret Mirabal also carried Harris County in 1996, but Katie Kennedy won a District Court race with a higher score, so Mirabal’s performance had no effect. Looking at these numbers, it strikes me that there’s nothing about Judge Davidson’s metric to invalidate the point I’ve been making. Since low-profile, low-information races like most judicial races are generally considered barometers of partisan preference, the STJV can be seen as a measure of how many people are voting for a party rather than a candidate in a judicial race. You can see why a lower number would generally be preferable. The thing is, though, that there’s not that much difference between the STJV scores in the years where Republicans were sweeping the judicial races and the two recent years in which both parties claimed victories. Indeed, it’s the year 2004 that had the highest STJV score, just as 2004 had a higher rate of straight-ticket voting than 2008, even though it was the latter year that started all this hand-wringing and pearl-clutching about the arbitrariness of straight-ticket voting, as if it had never been an issue in years before. That more than anything is what chaps me about the pious “reforms” being proffered by the likes of Sen. Patrick and the enabling he’s getting from the media. Where was all this concern between 1998 and 2006? I am against an appointment system. Always have been. Always will be. What I told the Chron is that our system works just great in counties with a population under about 60,000. In, say, San Angelo, if there is a bad judge, everyone in the county knows about it. A bad judge in San Angelo will lose regardless of party affiliation. The answer is more voter information about the judges. We had that back in the late eighties and early nineties, when the DJVs were in the mid teens. If the % of people voting a SPJV were to go from 97% to 85% again, the chances of a bozo of either party getting elected diminishes greatly. The last few cycles, the judicial candidates of both parties spent all of their money, not into educating the public about themselves, but on party material. This is, in part, the problem. I concede that where you have 40 judicial races on a ballot it is difficult for any one to stand out. To a limited but critical extent, that is what was going on in the late eighties. The voters’ guides then were printed by both newspapers. There are none today. You are right that I cannot expect a million voters to be made aware of the qualifications of all judicial candidates. But the number should be more than 29,000! If the number of voters casting a two party judicial ballot could go back to, say, 100,000, there would not be a problem. I agree that it’s harder to get away with being a bozo in a smaller electorate, though the extreme partisan split of Tom Green County, where San Angelo is the county seat, might be too high a wall a Democrat to scale, even against a Republican bozo. Be that as it may, I take his point, and absolutely agree with the idea of more publicly available information about judges and judicial candidates as the best way forward. Again, one of the strange things about this debate is that it’s happening at a time when we actually have members of both parties winning judicial races in Harris County. Before 2008, the last time that happened was Kennedy’s win in 1996. I’ll stipulate that split partisan results do not necessarily equate to optimally meritorious results, but I continue to be amazed by the fact that only now that Democrats are winning most of these races is it a political problem to be dealt with by such famous non-partisans as Dan Patrick. Of course, getting good, objective information out to the voters is easier said than done. Back in 1988, there were only so many ways to spread news. Put a story in the Chron and the Post and you were good. Nowadays, well, you know what the scene is like. Even if you could be confident in your distribution channels, ensuring that the data is objective, and more importantly is seen as objective by the audience, will be a big challenge. I’m open to suggestion if anyone has any thoughts on this. Anyway. Whatever you think the problems are with our system of making judges, the points I’m trying to make are 1) they didn’t just magically appear beginning in 2008, when the Democrats first started winning judicial races again; by every measure I can come up with, it had been like this for at least a decade, and 2) fixing these shortfalls will require more than simple, bumper-sticker solutions. Every approach has its pros and cons, and we can’t fix anything unless we really understand what it is we’re trying to fix and why our proposed alternative gains more than it loses. I promise, I’ll quit complaining about this if we ever get to that. My thanks to Judge Davidson for the feedback and the opportunity to explore this from another angle. It’s hard out here on a judge. For longer than anyone remembers, you had to be a Democrat to be a district judge in Texas – or just about any other political office. When the Democratic Party split apart in the South over civil rights, Republicans gained the upper hand, so much so that by 1998 you had to have an “R” next to your name to have a shot at statewide office. Recent election results show little change overall for the Lone Star State, still known as the reddest of the red. But in its largest metropolitan area, a new look is emerging. If the latest general election is fair measure, Harris County today is a brilliant, deep purple, almost evenly split between the two major parties. And nowhere does that cause more discomfort than the county courthouse, where judges suddenly find themselves with none of the job security that has often accompanied the job. Partisan dominance meant that if you reached the bench – often via political appointment – you had a reasonable chance of staying there for awhile. Now local judges are buffeted by political winds beyond their control, and they face the distinct possibility of losing their job just as they have figured out how to do it. Former Judge Mark Davidson, who often ranked at or near the top in local judicial polls, lost his bench in the Barack Obama tidal wave of 2008. He does not like what he sees now, with a polarized electorate voting along party lines, and he has no intention of running again soon. “To run and know it doesn’t matter anything about my or my opponent’s qualifications – that the outcome may be determined by who is on the top of the ticket and people will vote on criteria other than my service as a trial judge – is not something I choose to do,” Davidson said. What that means for the future is unclear, in part because it’s unfamiliar territory. Former Texas Supreme Court Justice Scott Brister, who spent more than a decade as a district judge in Harris County, predicts it will be harder to recruit good potential judges because of the uncertainty factor. If races are going to be narrowly decided and influenced heavily by the names at the top of the ticket, why would a successful, talented lawyer give up a comfortable practice for less pay and more risk? Of course, one way to solve this would be to go back to the good old days of one-party dominance in Harris County. I sure don’t remember all this hand-wringing about how hard it was to be a judge, never knowing what the voters might do to you, back when the November elections were pre-determined. If nothing changes about how we make judges and the Democrats sweep the judiciary in 2016, thus providing a third term to all those judges that were re-elected this year, will that make Mark Davidson and Scott Brister happy? Mark Bennett makes hash of Davidson’s complaint. The story then predictably goes into straight-ticket voting and Sen. Dan Patrick’s bill to eliminate it for judicial races, which has the hearts of people like Patti Hart and the Chron’s editorial board going pitter-pat. One of the many ironies of all this is that of the 32 district and civil court judicial races in which the Chron made an endorsement this year, 25 of their preferred candidates won. That’s a 78% success rate, which ain’t too shabby for a bunch of lazy, ignorant voters, as they so nicely characterized the straight-ticket people. Another irony for you: As Mark noted in his post, the straight ticket vote for each party this year basically canceled each other out. Indeed, the Democratic advantage from straight ticket voting in 2012 was a paltry 2,836 votes – 406,991 to 404,165 in favor of the Democrats. Would you like to know how many Democratic judges won re-election by 2,836 votes or less? Exactly one: Kyle Carter of the 125th District Court, who remained a judge by 1,694 votes. Every other winning Democratic judge had a margin that exceeded the straight-ticket margin: Michael Gomez, the next closest winner, won by 4,071 votes, Jaclanel McFarland won by 5,083, and Ruben Guerrero, Mark Bennett’s least favorite judge, won by 9,015. Every other victorious Democrat won by a five-figure margin, so if you accept the premise that only the non-straight-ticket voters really know what they’re doing, then you should be glad, because they decided all but one of the judicial races. Dan Patrick’s bill is basically about Kyle Carter. But wait, there’s more. In those halcyon days of Republican hegemony for which Mark Davidson and Scott Brister pine, surely they were aided by straight-ticket voting dominance as well, right? Well, thanks to the magic of the Internet, we can check. Election results on the County Clerk webpage go back through 1996. Here’s how those elections went. So Democrats had a 10,802 vote advantage, which did them exactly no good: The only judicial race won by a Democrat was that of Katie Kennedy, whose margin of victory was over 66,000 votes. Republicans won all the other races. Now the Rs have the advantage, of just under 14,000 votes. Their smallest margin of victory in a judicial race was about 23,000 votes, meaning that again, straight-ticket voting made no difference to the outcomes. Yes, believe it or not, Democrats had the straight-ticket advantage, even with George Bush at the top of the ticket. And again, it mattered not at all. There were exactly 2 contested judicial races – 337th and County Court At Law #1, both of which the Dems lost. Boy, were these the days or what? The Rs regain the advantage, and again it’s meaningless, as the closest judicial race was decided by 41,000 votes. Will straight-ticket voting ever matter? You would think that with a 45,000 vote advantage in straight-ticket voting, that would be critical to overall Republican success. But it only mattered in one judicial race, the 334th, where Sharon McCally defeated Kathy Stone by 41,813 votes. Republicans won every other judicial race by at least 60,000 votes. Another Democratic advantage that amounts to diddly squat, as the Rs once again sweep the judicial races. I suppose you could put an asterisk next to Jim Sharp, who carried Harris County by 1,291 votes in his race for the First Court of Appeals, but since he lost that race it hardly seems worth the effort. Finally, we come to the two years that everyone agrees is where straight ticket voting was the deal-sealer for the Ds and the Rs, respectively. It’s true that in 2008, the Democratic advantage in straight-ticket voting – 391,488 to 343,919 – is larger than the margin of victory for all victorious Democratic judicial candidate. But look, Democrats didn’t nearly sweep the judiciary in 2008 because of straight-ticket voting, they won all those races because more Democrats voted in Harris County than ever before, and it was that combination of juiced turnout and long-awaited demographic change that did it for them. I suppose you could argue that had the straight-ticket option been outlawed that enough Democratic voters might have quit voting before making it all the way to the end of the ballot to have let some number of Republican judges survive, but if you do make that argument can you really also claim it was because of their merit as judges that saved them? Besides, in the absence of straight-ticket voting its entirely plausible that enough Republican voters would have failed to complete the ballot to cancel things out, and we’d have had approximately the same results as we actually did. We’ll never know, and it’s presumptuous to think we do. Remember, as I’ve noted many times, there was a lot more Republican undervoting in 2004 downballot than there was Democratic undervoting. We just don’t know what might have happened. You may be thinking at this point “But isn’t the issue that so many more votes are being cast as straight-ticket these days”? It’s true that the trend is upward, but it’s less than you might think. And despite the wailing over 2008, it wasn’t a high-water mark for straight tickets. In 2004, 64.22% of all ballots cast were straight-ticket, 698,895 of 1,088,793. In 2008, the share of straight-ticket ballots dropped to 62.20%, as 739,424 of 1,188,731 were so cast. Did you know that there were more straight-ticket votes cast as a percentage of turnout in 2004 than in 2008, the year in which straight-ticket voting suddenly became this massive problem that had to be solved? I didn’t until I did the research for this post. I’ll bet you $10,000 of Mitt Romney’s money that no one at the Chron knew it, either. As for 2012, the share was 67.91%, 817,692 out of 1,204,167. My guess is that just as there appears to be a limit to how many people will vote early, there’s likely also a limit to how many people will push the straight-ticket button, and we’re probably pretty close to it. Oh, and in 2010, the year that straight-ticket voting supposedly gave the Republicans back the bench? They did have a huge advantage in straight ticket votes – 290,355 to 240,479 – but as it happens, their closest victory in a judicial race was just over 57,000 votes, with most races being decided by 80,000 or more. Republicans won in 2010 because they turned out at historic, unprecedented levels, plain and simple. The belief that straight-ticket voting is the key to victory is a myth, a shibboleth, and if it’s not clear by now that this is all about the 2008 results, then it’s not the straight-ticket voters who are lazy and ignorant. I have more to say on this subject, but this post is long enough. Again, I agree that our system of making judges is problematic, but straight-ticket voting is not the problem, and eliminating it is not a solution. It’s a feel-good measure cloaking a partisan intention, and it should be seen as such. And it’s a joke. Seriously, I can’t describe it any other way. 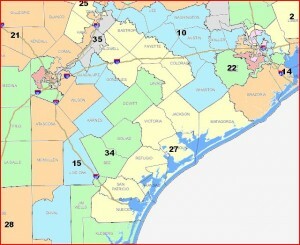 Look at the following districts – go to http://gis1.tlc.state.tx.us/ and look up Plan C125 – and tell me how they can possibly satisfy any rational legal argument for compactness or communities of interest. Let’s start with CD36, which forms a giant Gateway-style arch from Super Neighborhood 22 up into East Texas and down around to Orange County. Let’s continue with CD35, which basically snakes along I-35 from the northern reaches of Travis County to the southern end of Bexar County. 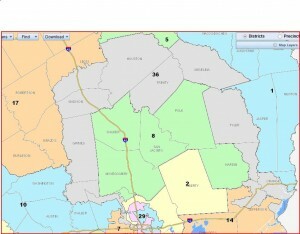 Speaking of I-35, if you drive it through Travis County, you change Congressional districts no fewer than seven times. 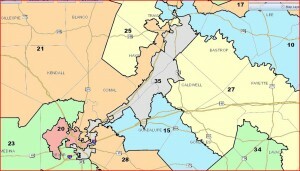 Here’s CD21, which spreads tentacles into both Travis and Bexar from the west. 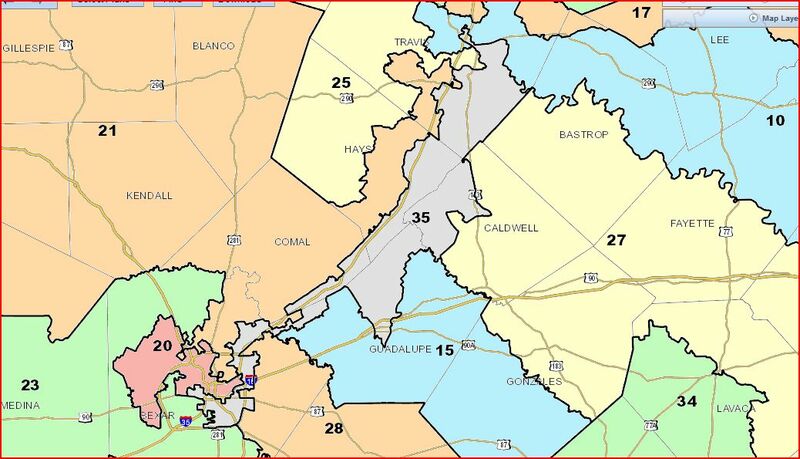 You really have to zoom in on the Bexar County portions of CD21 to fully appreciate its ridiculousness. The word “fractal” comes to mind in some places. As for Travis County, it gets split into five districts under this plan. 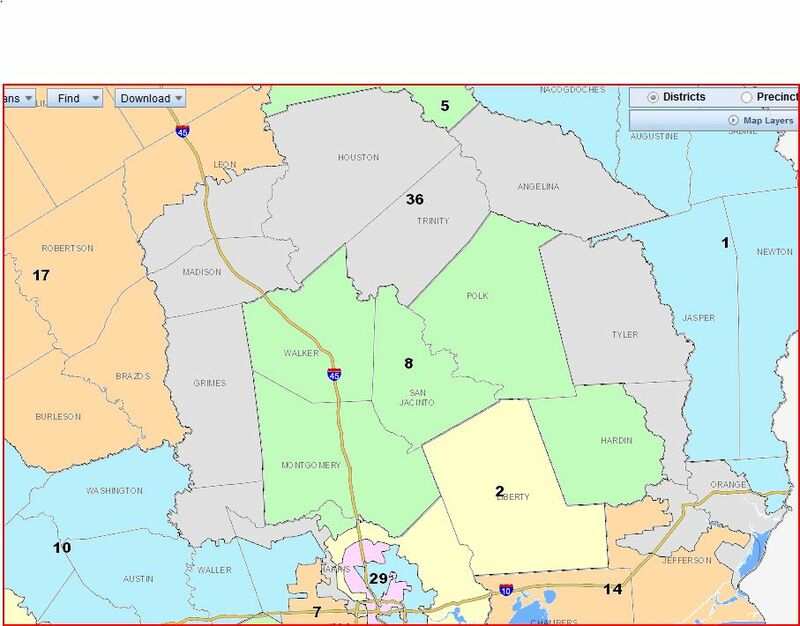 When I said that the Republicans would put a piece of Travis into every single district if they could, I wasn’t kidding. Here’s the GOP’s attempt to save Blake Farenthold by turning his district into one that’s more Hill Country and less Gulf Coast. There’s some similar juju with HD34, which I guess is supposed to be the Aaron Pena Special. Greg makes the case that CD27 is really a “new” district, much as CD25 is – it may contain Lloyd Doggett’s house, but it’s not his district in any meaningful sense – and that Farenthold is actually in CD34, with Doggett likely to aim for CD35, where he may or may not get knocked off by a San Antonio hopeful. I’ll defer to him on that, I’m just going by the existing district numbers. Some of these Republican districts are more purple than I’d have expected, and much as is the case with State House districts, it may be that in a cycle or two a few of these guys could be imperiled. It’s harder for me to say with such bigger districts, but the possibility certainly exists. Honestly, it’s a bit hard to believe this map represents a genuine consensus among Republicans, as there’s plenty more they could have done to make most incumbents safer while warding off the more obvious VRA-related complaints. But we’ll see. 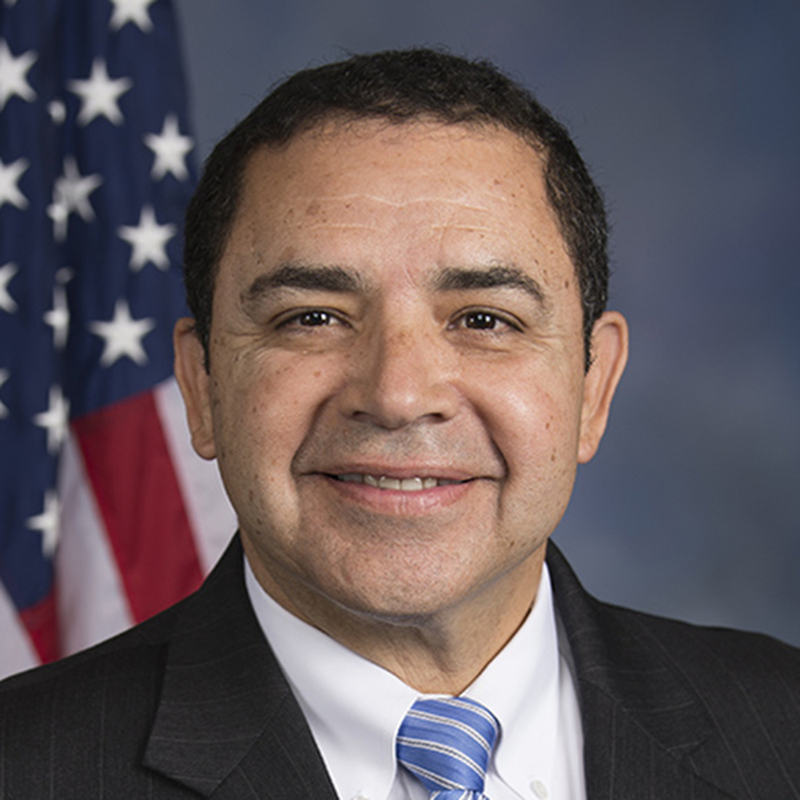 Last week, Rep. Veasey offered the Fair Texas Plan, a congressional map that provides electoral opportunity for the Texans who earned our state four additional congressional districts and meets the requirements of the Voting Rights Act. Today, Chairman Seliger and Chairman Solomons presented Texans with their proposed congressional map. An initial review of the proposed plan clearly indicates that it is retrogressive and creates only 10 effective minority opportunity districts out of 36 compared to the 11 effective districts in the current 32 member plan. “In fact, preserving only 11 effective minority opportunity districts when the state now has four additional seats due to minority population growth would still be retrogressive, and I have no doubt that a plan that has only 10 effective minority opportunity districts runs afoul of the Voting Rights Act,” Rep. Veasey said. Across the state, this discriminatory plan splits and packs minority communities. Nowhere is that illegal scheme more apparent than Tarrant and Dallas Counties. Veasey pointed out that once again, the Southeast Ft. Worth community he represents is separated from other areas of African American growth in Tarrant County and placed in a district that would be controlled by suburban Anglo voters. This time, the North Side Hispanic community is exiled to a Denton County district and Latino voters in Dallas-Ft. Worth are split into at least seven different districts. “A plan that splits and packs the 2.1 million African Americans and Latinos in Dallas and Tarrant Counties to provide us only one effective voice in Congress is not just illegal, it’s wrong,” concluded Rep. Veasey. MALDEF has a similar reaction. And as of Tuesday evening, the issue is now on the call with a hearing scheduled for Friday. In the meantime, another lawsuit has been filed. Just something to consider here: After the 1991 redistricting, subsequent litigation led to the redrawing of several districts, for which special elections had to be held in 1996. After the 2001 redistricting and 2003 re-redistricting, subsequent litigation also led to the redrawing of several districts, for which special elections had to be held in 2006. Point being, whatever map we have in 2012 is unlikely to be the map we still have in 2020. Anyway, take a look at this map and react as appropriate. I have 2010 electoral data here, and Greg has further analysis here and here. 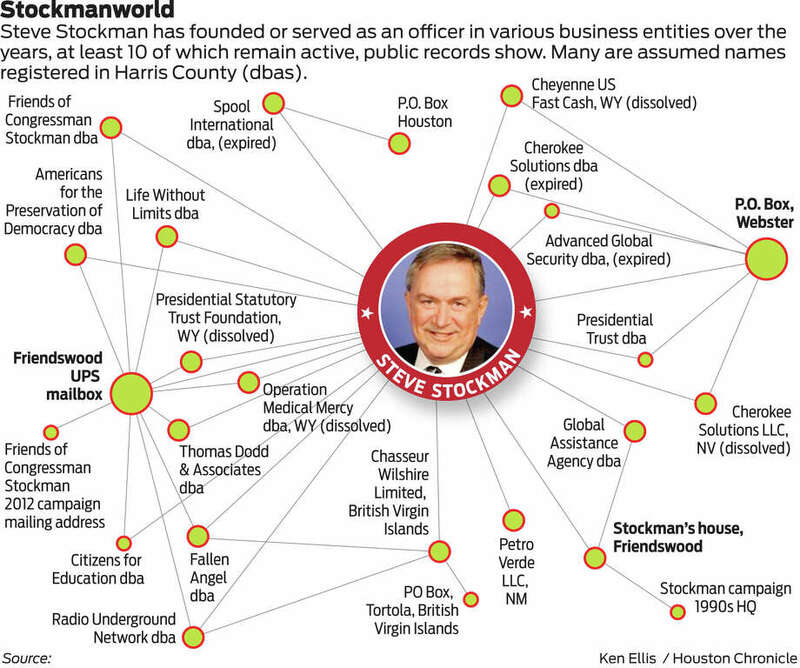 PoliTex, Trail Blazers, and the Trib have more.